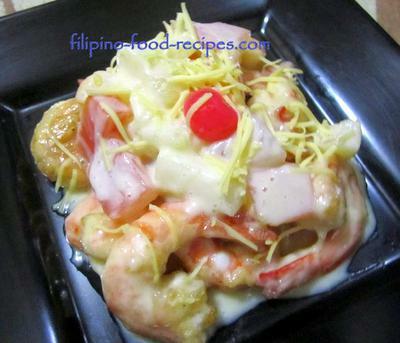 Hot prawn salad is a fancy appetizer of fried shrimp or prawn with fruit salad. It is slightly sweet and savory, creamy and tart. Add extra fresh apples for that extra crunchy texture, if preferred. For this recipe, I lightly coated the shrimp with flour so the prawns are not masked with any batter. But for the budget conscious or if serving at a party, I suggest to cut the shrimp in few pieces(to make like popcorn shrimp), make a tempura batter and deep fry. This will extend the dish to serve more people. 1. Peel the prawn and devein it. 2. Mix the flour, salt, pepper and garlic powder. 3. Dredge the prawn in flour mixture. Fry and set aside. 4. Combine the condensed milk and nestle cream and the fruit cocktail. 5. Toss the prawn in the mix. 6. Serve topped with grated cheese.